Modeled on a palace at Versailles, Marble House is decorated in the style of Louis XIV, which was, well, grand. Very grand. Richard Morris Hunt threw himself into building this mansion for William K Vanderbilt on Bellevue Avenue (Map of Newport) and finished it in 1892. Vanderbilt gave it to his wife, Alma, as a little 39th birthday present. To see the house, you take a prize-winning self-guided audio tour with a headset that allows you to select the descriptions you want to listen to. 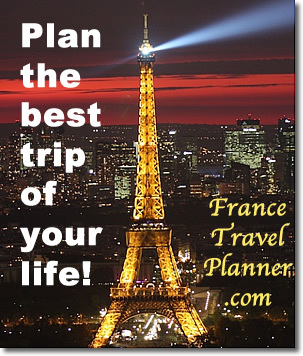 The architecture is classical, but the decoration is utterly French, that being the highest style at the time. 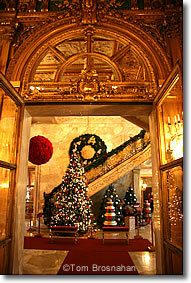 To the right after you enter is the Gold Room, a ballroom decorated with a king's ransom in gold. Room after room on two floors displays unbridled spare-no-expense luxury. Most of the interior doors are transparent, made of heavy bevelled crystal panels. Chairs in the Dining Room are made of brass, and were so heavy that a footman was provided to each diner to help move the diner's chair. As in The Breakers, the furnishings in Marble House are all original to the building; some have been restored. 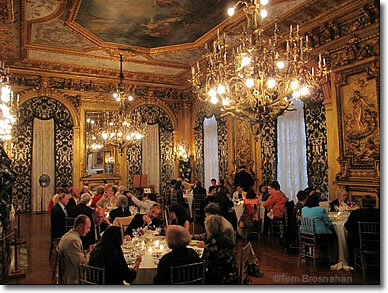 Besides the entertainment rooms, you'll visit the Vanderbilts' private rooms: boudoir, library, and bedrooms, as well as the kitchen and, across the lawn by the Cliff Walk, a fascinating oriental teahouse acquired in China and shipped to Newport. Even the wall out front on Bellevue Avenue is made from sparkling white marble. The spear-like cast-iron pickets in the enclosure are tipped with gold. One of the best times to visit Marble House is at Christmas, when it's decorated for the season in traditional Victorian style, and waiting lines to get in are short or non-existant. 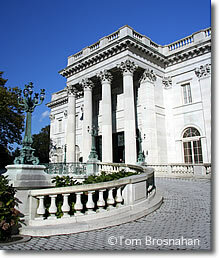 Above, Marble House, a sparkling-white marble palace on Newport's Bellevue Avenue.